While traveling in the French and Swiss Alps, the owners of this European inspired mountain chalet became captivated by the rustic charm of the over 200-year-old chalets they had seen there. 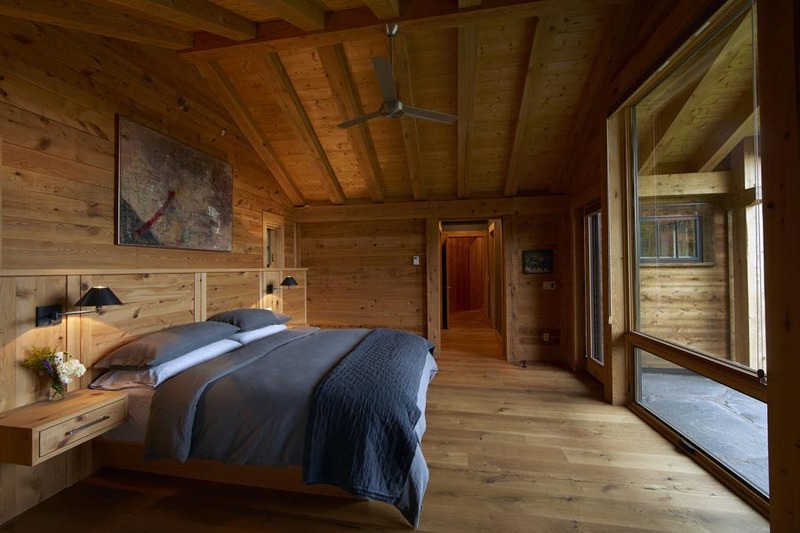 They perused numerous books about chalet design, becoming both well informed and even more enthusiastic with the building style. 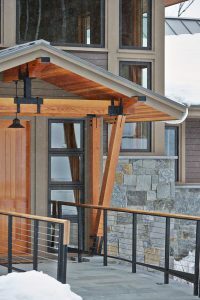 Working with architect Paul Robert Rousselle of Stowe and Steve Sisler of Sisler Builders, they incorporated design cues from traditional chalet construction, their own carefully cultivated theme ideas, and state-of-the-art energy usage desires to bring their unique European inspired mountain chalet to fruition for the 21st century and beyond. The couple and their three children, ages 13, 18, and 20, are originally from Long Island. 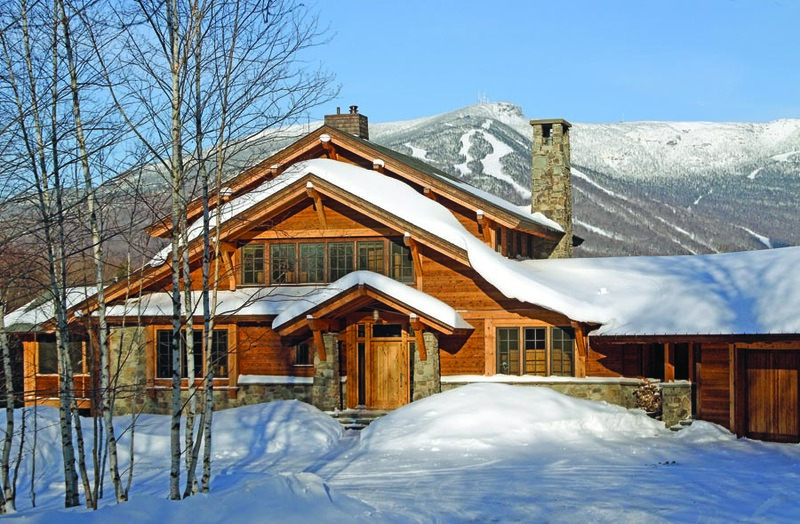 They moved to Stowe for its quality of life, easy access to sports, and the outdoor activities they enjoy. They rented a home while beginning the process of designing their house, finding an architect, and deciding on a builder. After meeting with Steve and checking with a variety of reference sources they chose Sisler Builders. 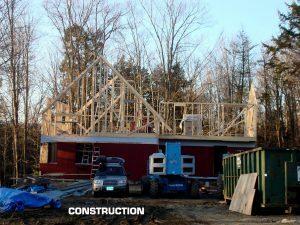 Steve had done similar chalet-style construction, and they felt that besides his reputation for perfection and integrity, he and his team were well suited for the job. 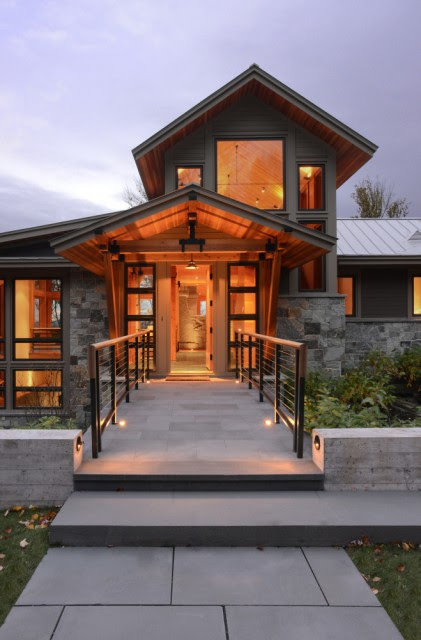 They also knew that Sisler Builders is committed to building highly energy efficient homes, a priority for them. Beyond being committed to the chalet aesthetic, the couple’s primary objectives were an open and functional layout, natural flow, and ease of use. They wanted to maintain a timeless look, so the house never felt dated. 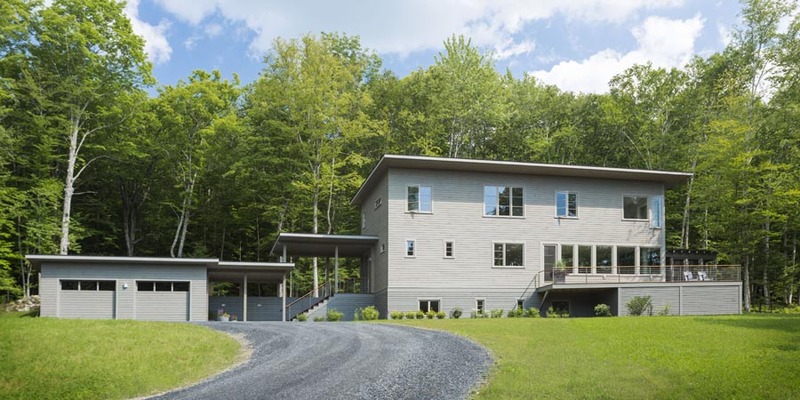 They also wanted to take advantage of the fantastic sloping site, situating the house so that it made the most of the jaw-dropping views of Stowe’s ski trails. The floor-to-ceiling windows all across the main living areas did the trick for this last desire! The nearly 4,500-square-foot structure is extremely air tight and energy efficient. It is heated with geothermal wells connected to electric heat pumps, which are partially powered by photovoltaic (PV) solar panels. 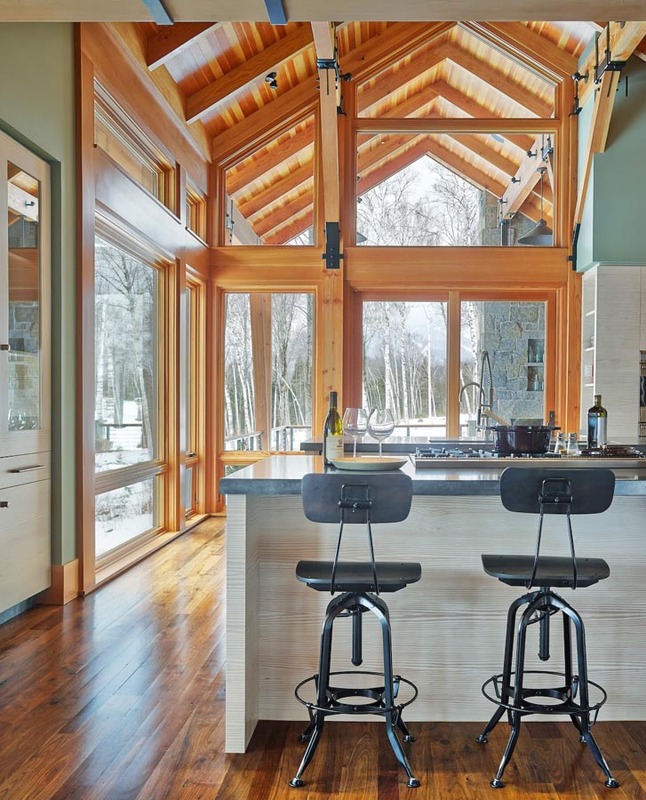 A wood stove, cleverly connected to duct work that is part of the air conditioning system, allows heat to be distributed throughout the home, instead of being concentrated to the area close to the woodstove. The structure tested out at 0.82 ACH50, which means it has a nearly Passive House air exchange level, and is remarkably air tight. It has radiant heat tubing embedded in the concrete slabs of both the lower and first floor levels. This is a well-thought-out system, as the heat pumps can readily produce water at just the proper temperature for optimal radiant heating. With the exceedingly low natural air-exchange rate, a mechanical heat recovery air exchange system was mandatory. Sisler Builders optimized the amount of insulation installed by computer modeling the front-end cost of different thicknesses of insulation versus the operating cost associated with those thicknesses. 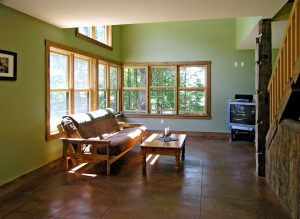 With this proper engineering and holistic mechanical system approach, the owners have found that the wood stove heats the entire house, and are ecstatic about the inexpensive heating costs and comfort they feel year round. Locally sourced materials strongly influenced the house design. 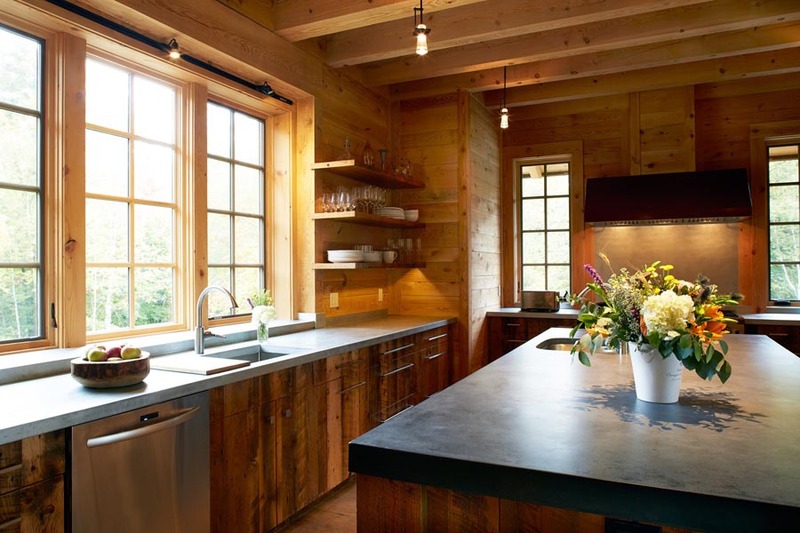 A significant contributor to its look and feel was the use of native hemlock beams and paneling that were procured and milled nearby. Sisler Builders took special care to purchase and sequence their installation in order to facilitate proper drying of the wood. The wife’s favorite aspect of the interior is the mix of rustic and modern design themes throughout the house, which were achieved with materials such as the native hemlock beams juxtaposed with refined tile and crisp sheetrock detailing, finished in striking colors. 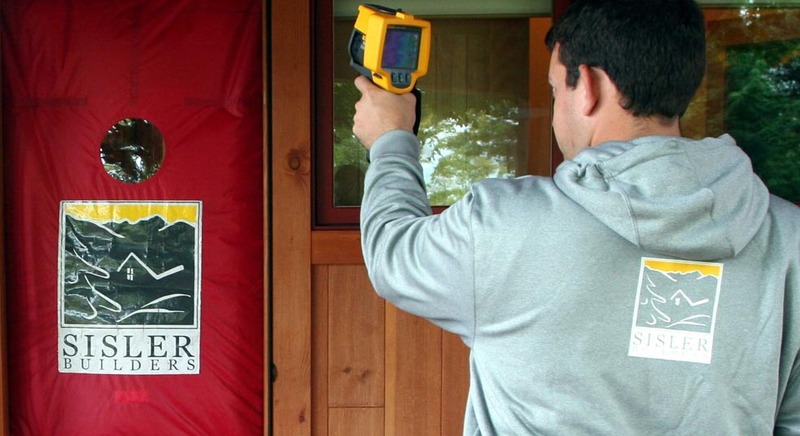 The last five houses that Sisler Builders completed have all tested with ACH50 less than .85. But what does that mean? What is ACH50? Get ready for some physics! ACH50 is the abbreviation for air changes per hour at 50 pascals (Pa) pressure differential. 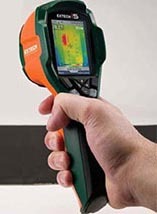 It is how we measure the energy efficiency of a house. It is the number of times the air volume in a building changes per hour at 50 Pa of pressure. During a blower door test we depressurize a building to negative 50 Pa pressure, with regard to the outside air pressure. We accomplish this by continuously exhausting a measured volume of air from the building with the blower door, while simultaneously measuring the pressure differential from inside to out. We adjust the bower until we reach our target pressure differential of negative 50 Pa, and then record the volume of air being exhausted to accomplish this in cubic feet per minute (CFM). 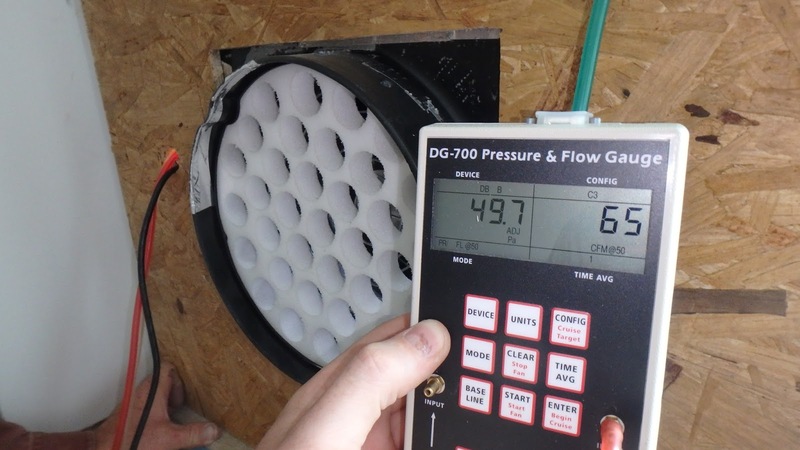 This measurement is called the CFM50 of the building and quantifies the air leakage of the structure being tested. The higher the CFM50, the leakier the building. CFM50 is the building performance standard used almost universally to quantify building air leakage, but it is not a very useful number for evaluating how “tight or leaky” a building is, unless we know a little more about the structure. For example, a giant warehouse may be quite tight, but have a high CFM50 compared to a small house that is quite leaky, because of the enormous discrepancy in the volumes of the two buildings. In order to compare the relative “leakiness” of separate buildings we need to account for this potential difference in structures’ volumes. To do this we use both the CFM50 and volume to calculate what is called the ACH50 – air changes per hour at 50 Pa pressure differential – of the structure. This number indicates the number of times in one hour the total volume of air in the entire building will be exhausted through the blower door when it is maintaining -50 Pa pressure differential with regard to the outside air pressure. The CFM50 tells us how many cubic feet of air are being exhausted from a building every minute to reach -50 Pa. To calculate ACH50 values we multiply the CFM50 number by 60 minutes per hour to determine how many cubic feet per hour are being exhausted. Now we divide this product by the total volume of the building in cubic feet and we know how many times this volume will be exhausted in on hour at this pressure. Voila. The ACH50 values! A building’s ACH50 number indicates how tightly a building was originally constructed (or later air-sealed) and is an excellent gauge for comparing leakiness between buildings. The lower the ACH50 values, the tighter the building. 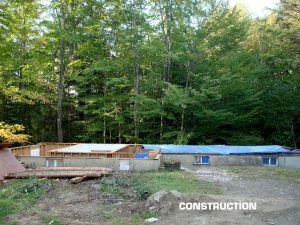 Vermont’s residential energy code currently requires new houses to have an ACH50 of 3.0 or less. By comparison, many older houses we’ve tested have ACH50 numbers of 10 or more, and some have been much, much higher. 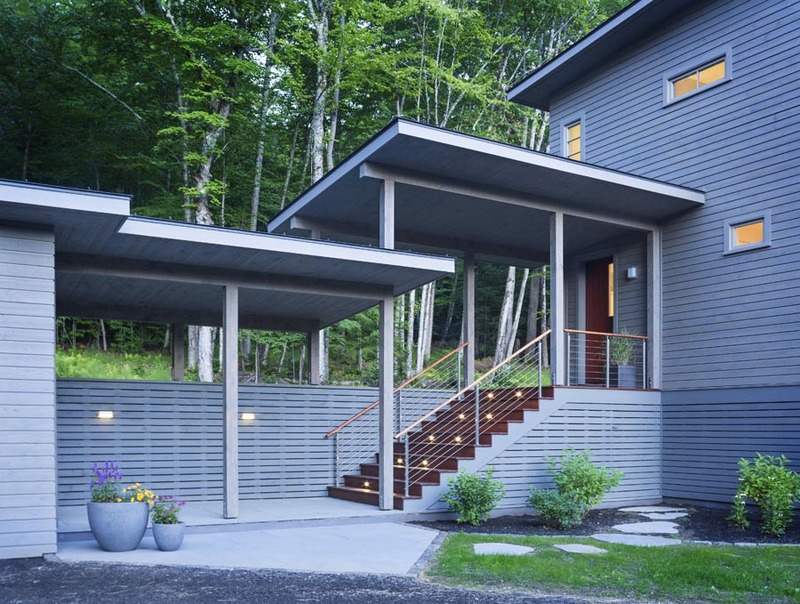 Today’s high-performance houses typically have ACH50s closer to 1.0. The last five houses that Sisler Builders completed all have ACH50 of less than 0.85. 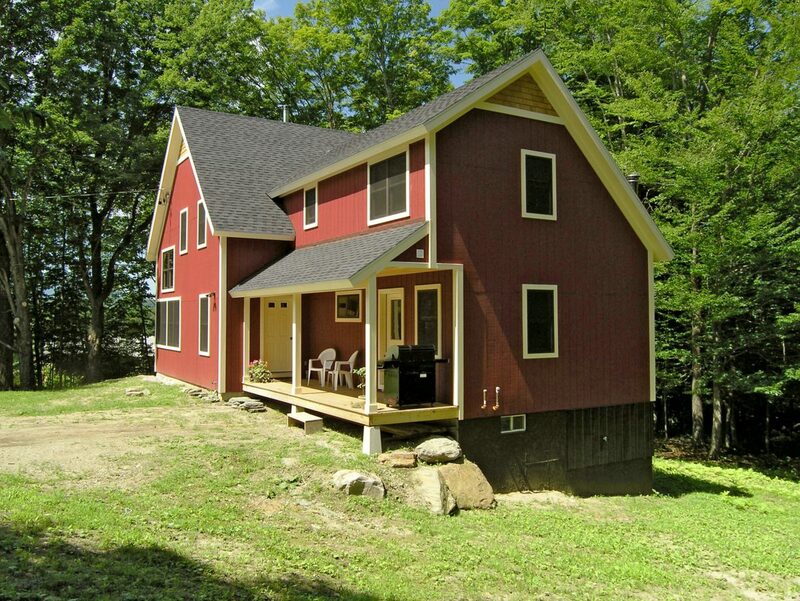 Here is an up-close look at two energy efficient Vermont homes built by Sisler Builders in Stowe, Vermont. 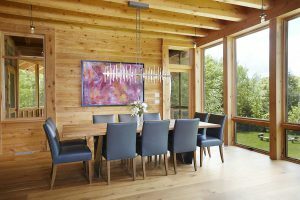 Ernie Ruskey and Laurie Wood had three primary objectives when they built their house in Morrisville: simplicity, energy efficiency, and harmony with the site. 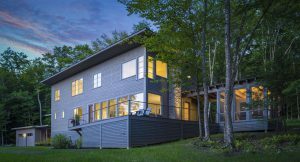 They achieved their goals with a minimalist modern design, a home that is super tight, has excellent air exchange rate results, and heats easily with propane and supplemental wood. 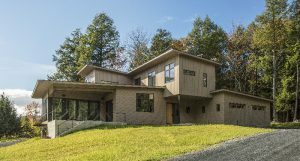 The house is nestled on a gentle, wooded hillside, with mountains views to the west, and blends unobtrusively with its surroundings. “One goal in all of our work is to have a house that fits into the site and landscape. 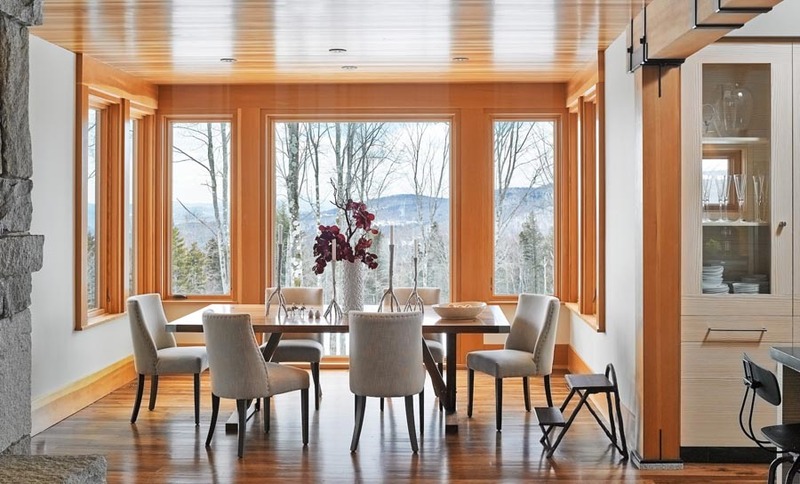 It’s always about the view and topography,” says Ernie, architect and owner of Tektonika Studio Architects in Stowe. He designed their house, which has a wedge shape that is, shall we say, wedged into the site’s natural topography. The garage is a half-story down, connected by an open, covered walkway leading to the staircase and main entry. Passing through the mudroom and kitchen to the light-filled great room you notice the subtle widening of the space. In consort with the nine-foot ceilings, expansive west-facing windows, well detailed maple stairwell, and natural stone hearth, this is a truly inviting space. A deck and screened porch off the wide end enable outdoor living close to nature. As a Stowe architect, Ernie knows many local builders, and choosing one to build a house he designed for his family was a difficult decision. “I gave several builders a shot,” he says. “Sisler Builders was on the short list of three companies. Their bid was the middle number and it felt realistic. I also felt good about the company’s project-management skills and their deep energy-efficiency knowledge. Sisler Builders’ core tenet is building the tightest envelope possible at a cost that doesn’t break the budget. Their seven years of focused home energy analysis and retrofits has shown them where typical problems are, especially for air and heat leakage. 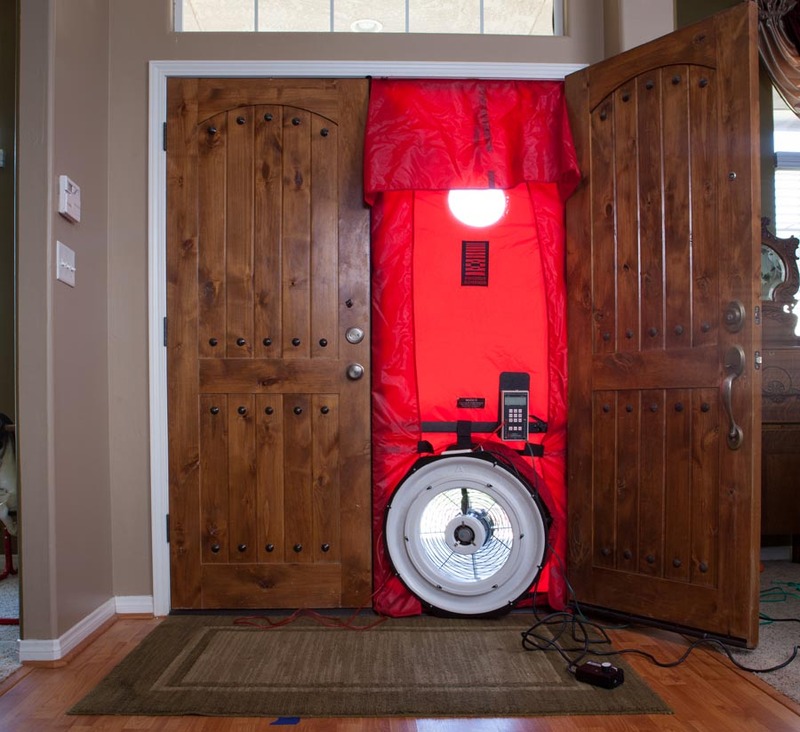 Whether building a new house or an addition, their crews know what to do to make sure there are no egregious air leaks in places that are difficult, costly, or impossible to fix later. 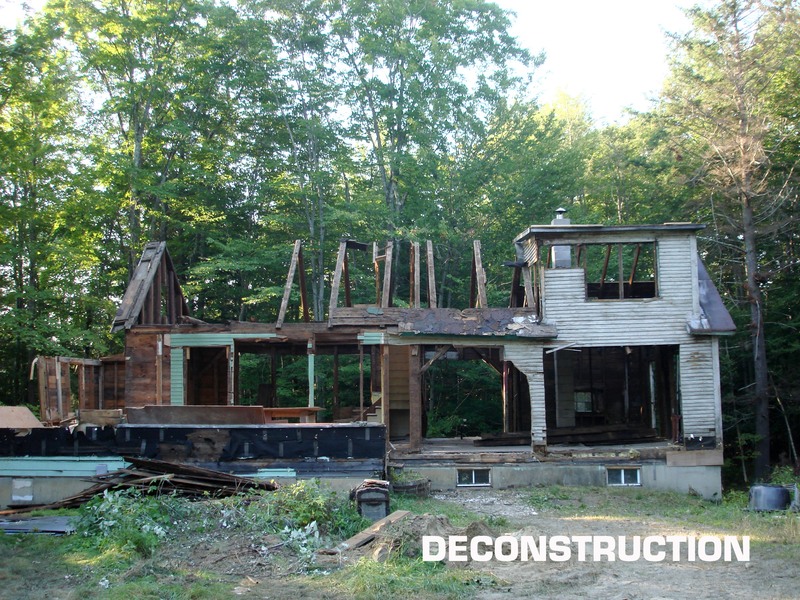 Jo and Jonathan (JP) Poole of Concord, Mass., had similar goals when building their house in Stowe. Simplicity was their primary objective. 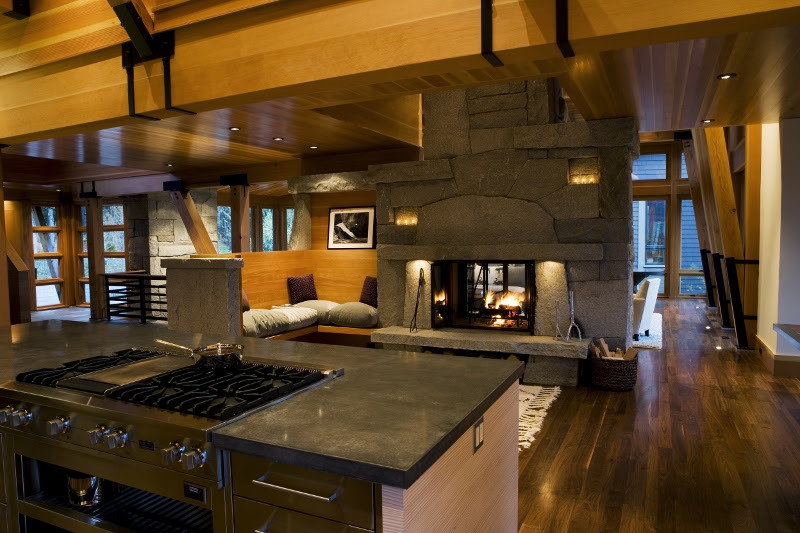 They wanted a modern design, small enough to feel cozy, yet large enough to accommodate guests. 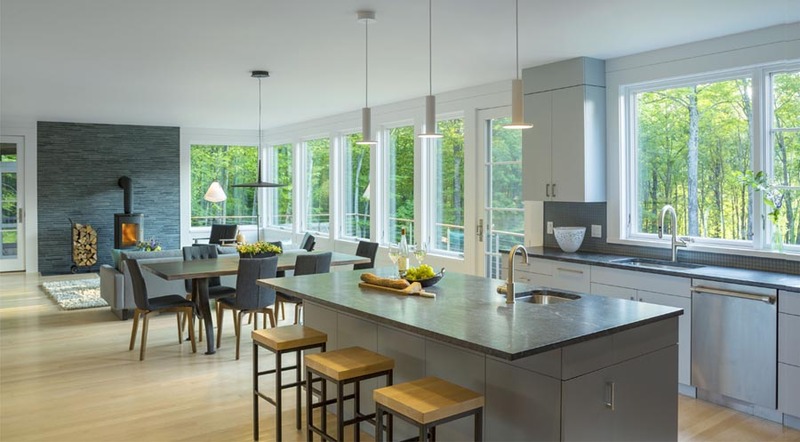 They also wanted a house that was ecologically friendly and sustainable, which led them to a solar-powered geothermal heating and cooling system which uses only renewable resources. When the Pooles moved from the United Kingdom to the United States, they first came to Stowe. They ended up in Concord, Mass., where JP works in biotech and Jo owns Concord Fitsquad. 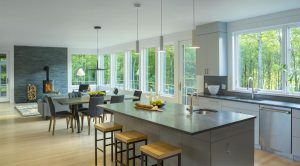 They continued visiting Stowe, and when it was time to build their house they reached out to Sisler Builders, whom they had heard about around town, particularly in the context of highly energy-efficient, ecologically friendly construction. At both the Poole and Ruskey-Wood residences, Sisler Builders implemented a combination of recently introduced energy efficiency building products and practices. When building the envelopes they used Huber’s superior Zip-R wall-sheathing panel and proprietary tape. With careful application of the tape at all seams you can cost-effectively ensure a tight building envelope even before insulation is applied. 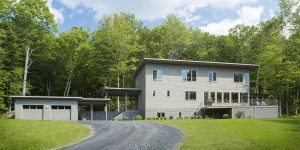 Sisler Builders did that at both homes, achieving air exchange level’s really close to the rigorous Passive House Institute US best practice standards, and they did it cost effectively. The Poole house begins with the main-floor mudroom, which includes a huge, open-riser, three-story, steel-supported staircase. Beyond that is the heart of the home, a spacious and airy great room/kitchen/dining room. 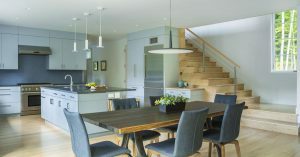 “The mud room and open-plan living area were primary for us. We focused our resources there and on the staircase,” JP notes. 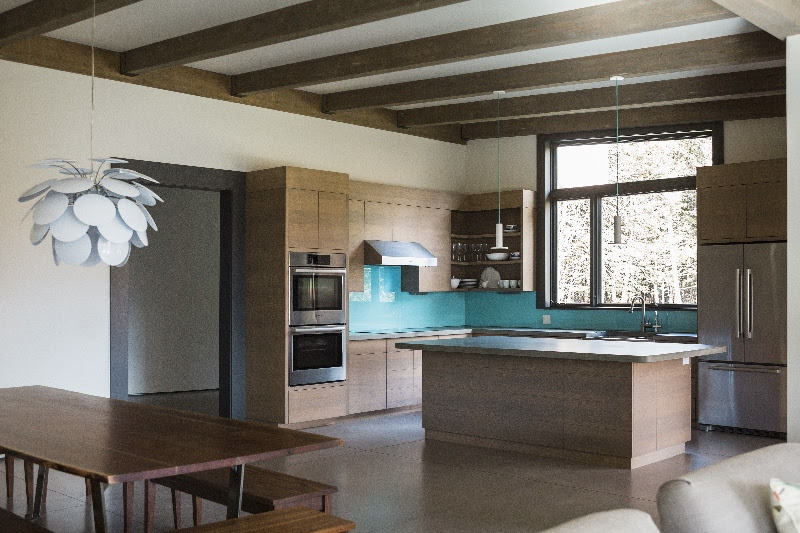 The house is entirely electrically driven, with LED lighting throughout. 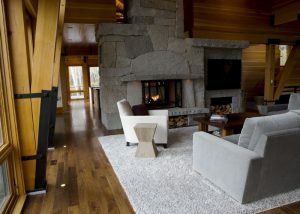 Radiant heat is powered by a closed loop geothermal system supplemented with a modern Hearthstone soapstone wood stove. Their 4.9 kW solar array provides about 70 percent of all the electricity the home uses. One of the best ways for homeowners to reduce their carbon footprint starts with home energy audits. Within hours they learn how efficient their home is and what they can do to improve it. 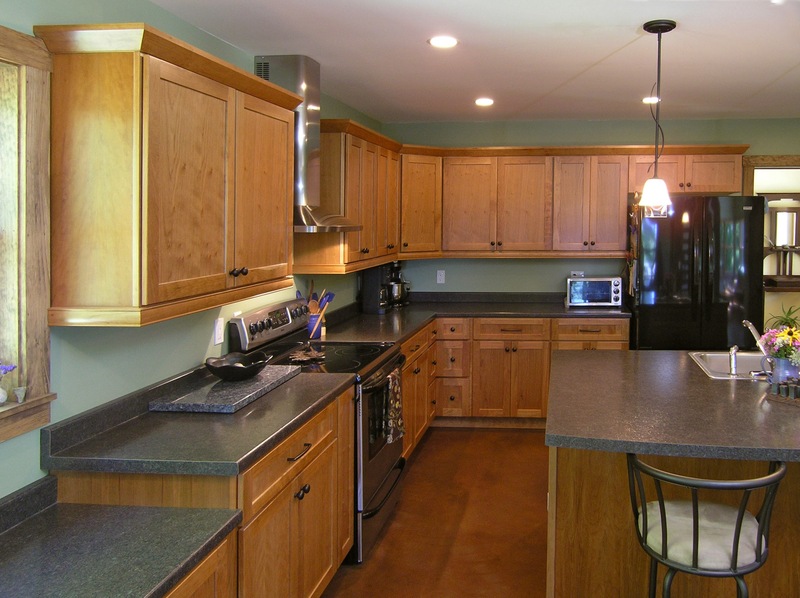 Another way is to build a home that meets or exceeds state energy efficiency standards. Research has shown that housing accounts for approximately 40 percent of energy usage. If everyone took steps for making old and new homes more efficient, that number could be cut in half. Sisler Builder’s energy division has grown to include six employees. Mike D’Muhala is the technical and “science guy,” while Brian Irwin is the business manager and marketing director. A crew of four does home energy audits, installations, and retrofits. Since 2010 they have performed several hundred home energy audits, resulting in over 160 home and commercial energy retrofits. To date D’Muhala estimates that these customers have saved 16 billion BTUs and 109 thousand kilowatt hours of electricity. This equates to about a quarter million dollars in savings and a 2,000-ton reduction in CO2 emissions, roughly the same as removing 500 cars from the road for one year. 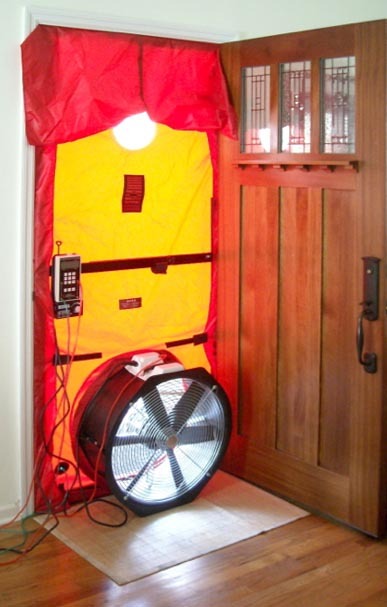 “The most common problem we see when we do home energy audits is air leakage,” says D’Muhala. 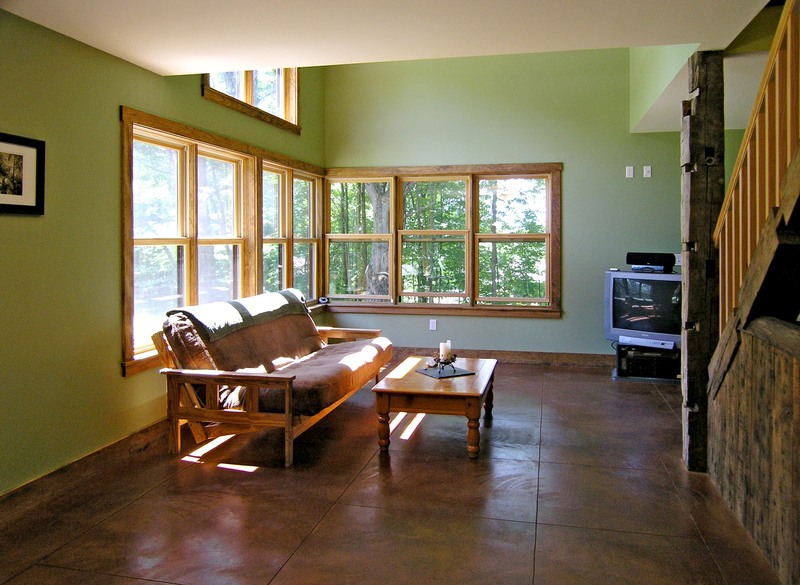 “We partner with Efficiency Vermont, and they will give a $1,000 rebate if a client reduces air leakage by 35 percent. This can be done primarily through blower door-assisted air sealing of the attic deck, basement, and living spaces.” Additional incentives are available for upgrading insulation and heating systems. Sisler Builders charges $450 for home energy audits and Efficiency Vermont gives an instant $100 rebate, so the cost to the customer is $350 for a typical house. D’Muhala conducts the audit, spending an average of three to four hours on site, inspecting and conducting tests. 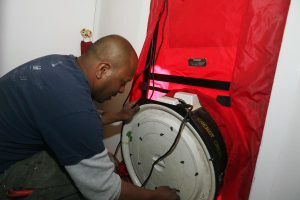 He uses a blower door, a machine that measures the air tightness of buildings, and a thermal camera to locate air leakage sites. D’Muhala then puts together an energy model of the home which he uses to generate a list of recommendations including their costs, energy savings, and estimates of Efficiency Vermont rebates. This model can be tweaked to meet budget, lifestyle, and aesthetic preferences. D’Muhala has been imparting the lessons he’s learned to the site supervisors and carpenters involved in Sisler Builders’ new home and significant remodel projects. The symbiotic relationship Steve Sisler was hoping for in 2010 has borne fruit! Of the six new homes they completed since 2012, all have exceeded the rigorous state-mandated testing amounts by at least 300 percent. 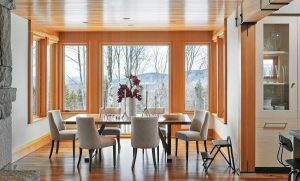 One earned kudos from Efficiency Vermont Senior Energy Consultant TJ Holloway when he noted, “The air density (temperature) corrected blower door number is 509 CFM. This is really, really tight! Passive house tight.” This attention to detail results in reduced energy consumption, pollution, and maintenance coupled with increased interior comfort. 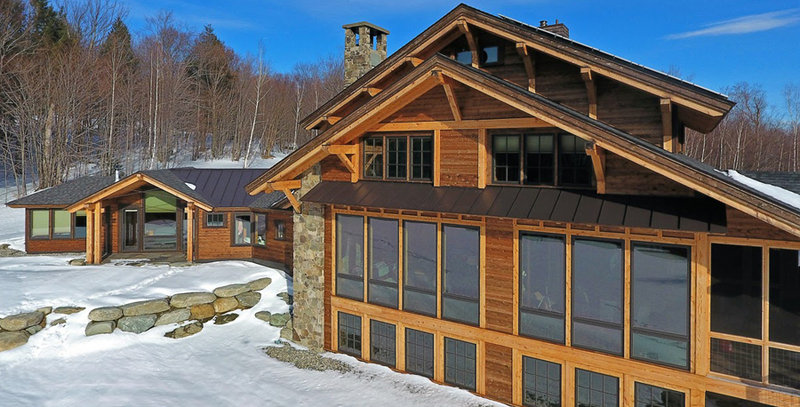 Sisler Builders is a member of Efficiency Vermont’s Home Performance with ENERGY STAR program and their Efficiency Excellence Network. To schedule an energy audit or for information about reducing your carbon footprint call Brian Irwin at Sisler Builders, 802-253-5672. Nick Sisler believes that air-source heat pump technology is the way of the future. Sisler, co-founder and engineer at Ekotrope, is one of a growing number of experts in the energy, building, heating, and environmental fields. “By allowing us to heat with clean renewal energy generated by photovoltaics, wind turbines, or a hydro plant, electric heating will be an important and necessary step in cutting greenhouse gas emissions,” Sisler says. Mike D’Muhala, energy division manager at Sisler Builders, is also on board with heat pump technology. Hearing him explain concepts like heat of vaporization, coefficient of performance, compression, joules, and absolute zero makes you wish you’d paid more attention in physics class. Even when the explanation is put in simple terms (“just an air conditioner running backwards” and “the same technology as a refrigerator”), it still feels like there must be magic involved in heating a home by extracting heat from cold outside air, even when it’s below zero. Whether it’s physical or mystical, it’s economical: newer heat pump technology can provide much lower cost heating, cooling, short payback of investment, and lower carbon emissions. The Second Law of Thermodynamics shows that when two things of different temperatures approach each other, the hot thing cools and the cold thing heats up. This natural law has been used for cooling for decades, most notably in the form of refrigerators and air conditioners. 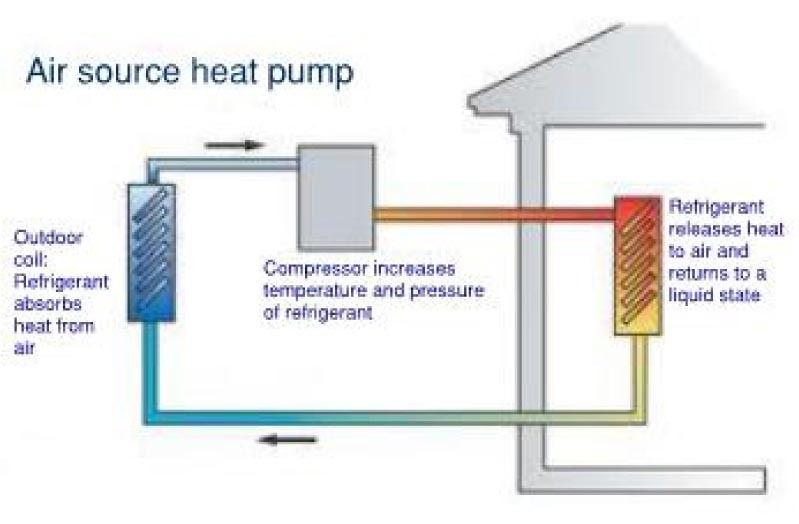 Essentially, an air source heat pump takes the heat out of ambient outside air (there is heat in outside air, even when it’s well below zero) by passing a chemical refrigerant though coils outside. As the liquid refrigerant heats, it becomes a vapor (just like boiling water). This hot vapor is then forced through a compressor (using electricity) to further raise its temperature. It is then pumped through coils inside the home, where the heat is released. As the vapor cools (releases its heat) it condenses back into liquid refrigerant, and the cycle repeats itself. What’s new in heat pump technology? For some time, ground source (geothermal) heat pumps have been transferring the nearly constant temperature of the earth into dwellings to heat and/or cool them. Often, though, installation costs for these systems can be high. In warmer climates, air source heat pumps have also been used effectively. The benefits of air source heat pumps sometimes seem too good to be true. By one measure, called the Coefficient of Performance, air source heat pumps can provide three to five times more heat energy than they consume in electricity. 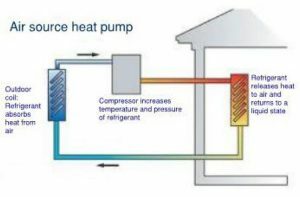 Some heat pump evangelists are predicting that this efficiency will increase to 10 or more, and could revolutionize our energy future. Heat pumps also need not be just air-to-air. 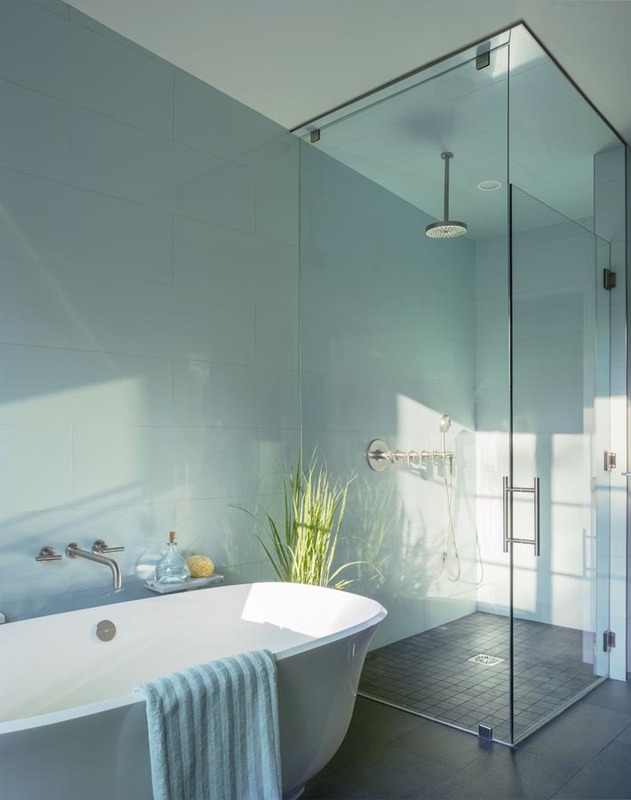 Air source systems are also able to heat domestic hot water, and may even integrate with or supplement traditional forced hot water heating systems. 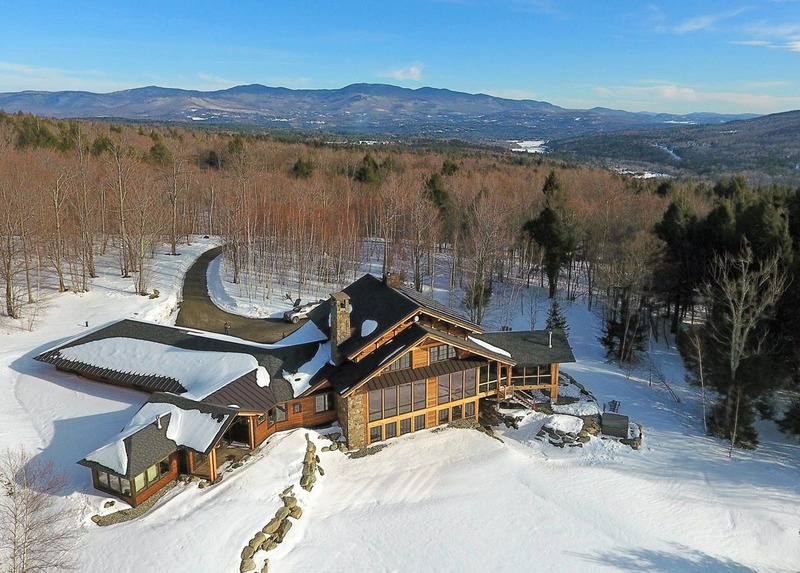 There is at least one electric utility in Vermont (Green Mountain Power) that, along with Efficiency Vermont, recognizes the value of heat pumps and is offering incentives or special rates to save even more money. There are drawbacks, of course. Current heat pumps may not provide a whole-home heating solution. A drafty house also lowers the benefits. Performance declines as the temperature drops, and another heat source is needed for cold Vermont winters. Also, if electricity prices should increase dramatically, the economics would become less appealing. 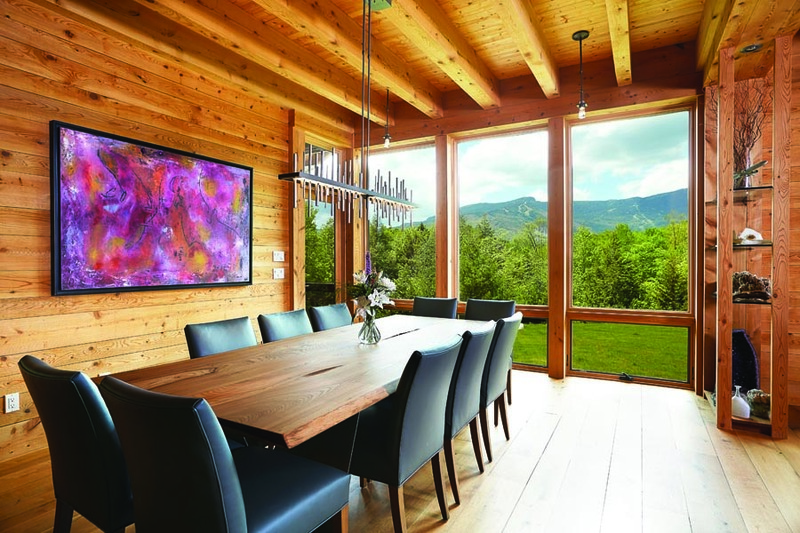 Sisler Builders is embracing air source heat pumps, as they may fit within a custom home, and especially within their energy division. Mike D’Muhala is using his expertise and magic in providing efficiency audits and retrofits, and is including heat pump technology in the alchemy. It’s a well-known fact that good communication in the construction industry is crucial to a project’s success. This couldn’t be truer than in our business, where the success of each project depends heavily on the careful management of hundreds if not thousands of small details. Having the right materials and equipment, the right crew and subcontractors, and the right architect and other professionals are very important, but it’s the coordination of these various people and elements that typically make or break a project. I tell our people that they should never be afraid to ask a question or to speak up if they don’t understand something, or if they see something that doesn’t look quite right. I try to do the same in my own dealings with our customers, their architects, and everyone else involved in our work. It’s a policy that has kept us out of trouble and allowed us to grow our business and to continually expand our skill set. The owners, the architect, structural engineer, landscape architect, and many of the vendors for a specific project may be new to us. By creating efficient, open lines of communication, we are able to gain the owner’s trust and confidence and to reduce the stress of all involved. 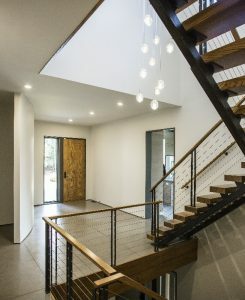 On one project we were challenged to explore and utilize new structural techniques and new and different approaches to custom door construction, timber framing details, main stair construction, and interior trim detailing. It felt good to be pushed; to demonstrate the extent of our skills and to build upon them, something we never would have been able to do without the confidence of all involved. I like to think that our enthusiasm for pushing the envelope is part of our company culture. 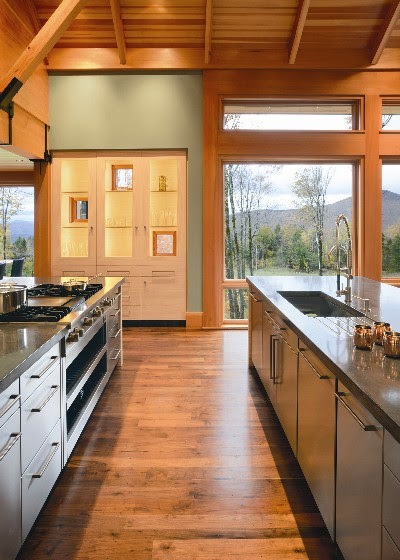 Custom homes, large or small, often contain fresh sets of challenges to make our lives interesting, and after 30+ years we have a pretty good base of experience to help us make sense of the new challenges and opportunities that each project presents. Of course, the other key to good communication is being a good listener. We try very hard to listen to our customers and their design teams and to understand their needs. Again, this not only helps us to avoid mistakes, but it’s also led to some very interesting opportunities for us. Our new custom woodworking division is a perfect example of this. 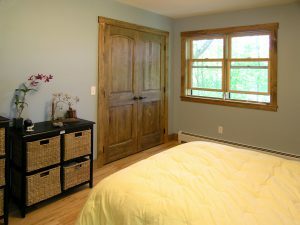 In recent years we’ve seen a growing interest among our customers in things like custom built-ins, freestanding furniture, and other intricate woodworking applications. 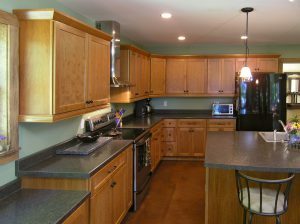 The woodworking division allows us to meet this need while broadening our overall skill set and offering a creative outlet for some of our most talented people. And besides, it’s FUN! 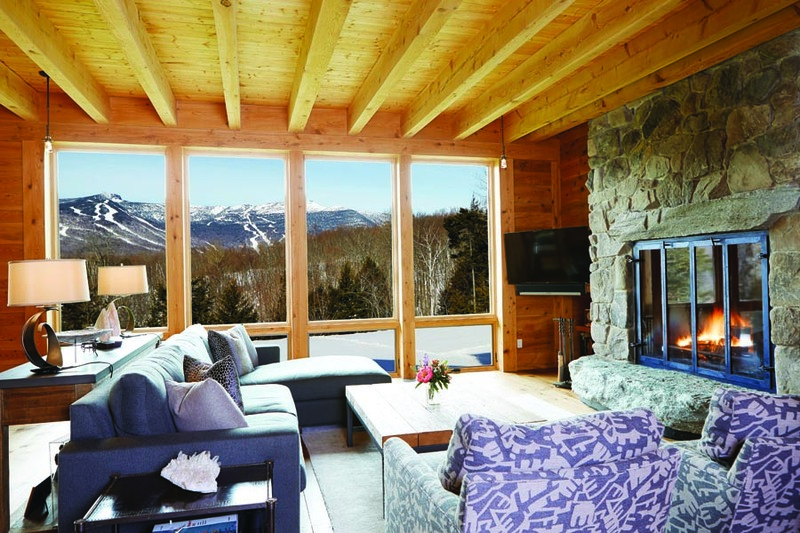 Gordon, who works in money management in Boston, took their vision for a contemporary Stowe mountain house to Steve Sisler. 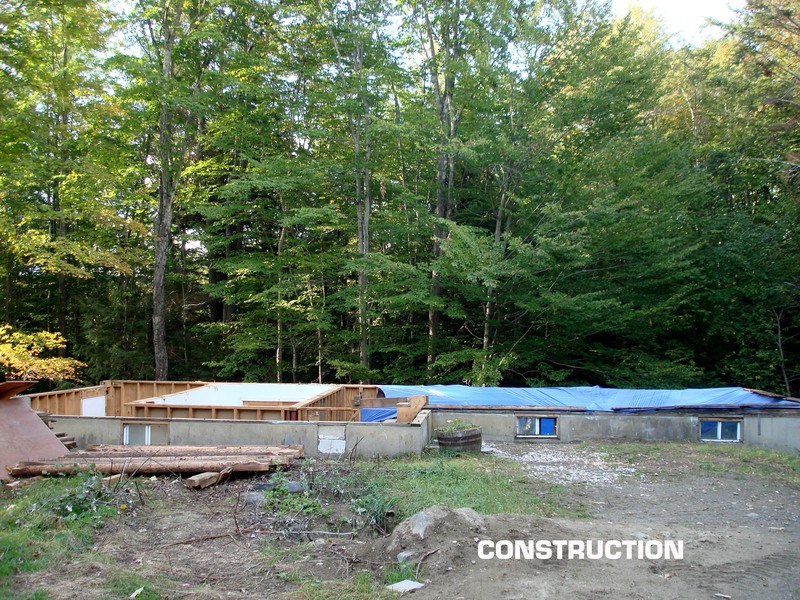 What did the Stowe-area builder make of this? Dreams. That’s how many conversations begin with Sisler. “We try to create synergy between the owner, architect, and builder to make ideas come to reality,” Steve says. 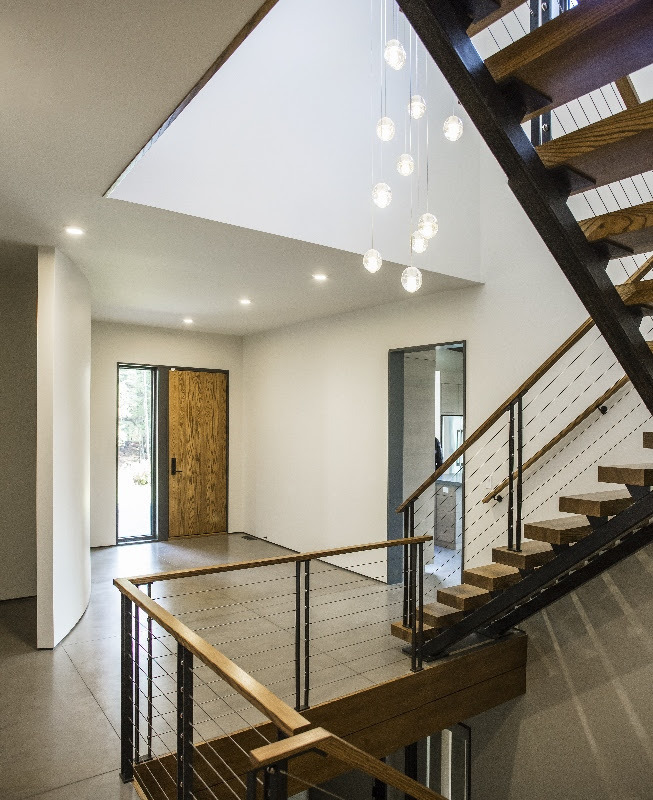 The Gordon house combines elegance and innovation, and uses a mix of local and imported materials, while featuring state-of-the-art energy efficiency. 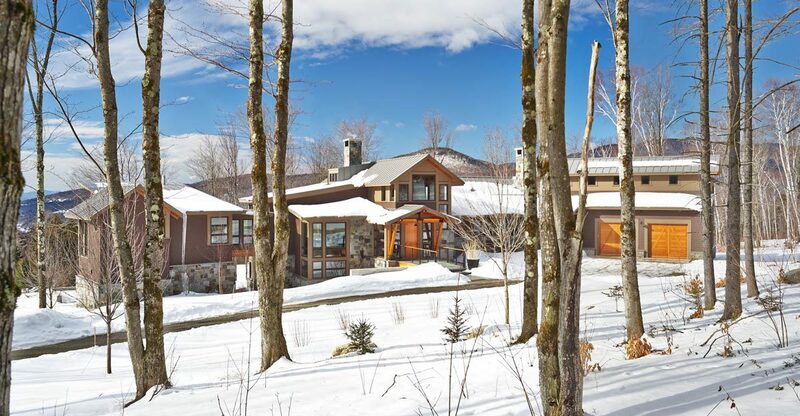 Outside, the Champlain valley stone veneer and the Douglas-fir timbers have the feel of a ski lodge. 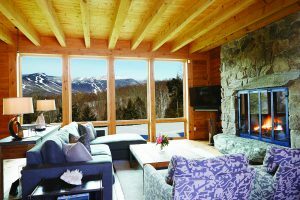 Inside, giant windows are oriented toward the mountains, bringing the grandeur and beauty of the landscape into the living room. The master bedroom is connected to the house via a bridge over a dry river. Downstairs is all about fun: there is a TV and spacious rec room with bleacher seats and cozy nooks for the three Gordon children to hang out. The kitchen has large concrete countertops beneath cathedral ceilings clad in Douglas-fir and surrounded by warm natural-hued southern yellow pine cabinetry. 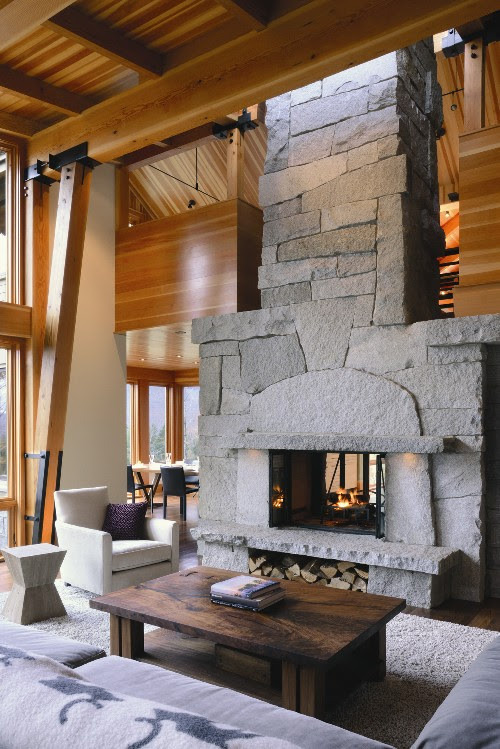 A stone fireplace rises two stories and features an interplay of Woodbury granite and timbers. It’s striking, but not too massive. Steve explains that there is a story behind the fireplace. He, Marcus, and mason Matt Parisi traveled to the defunct Woodbury quarry, the oldest quarry in the country, to pick out the perfect slab of granite for the lintel—the large stone over the firebox. As they spent an afternoon hiking around the quarry, balancing different stones on each other, they sent picture messages to Doug to get his real-time input. The end result is a fireplace that is a striking centerpiece of the house. 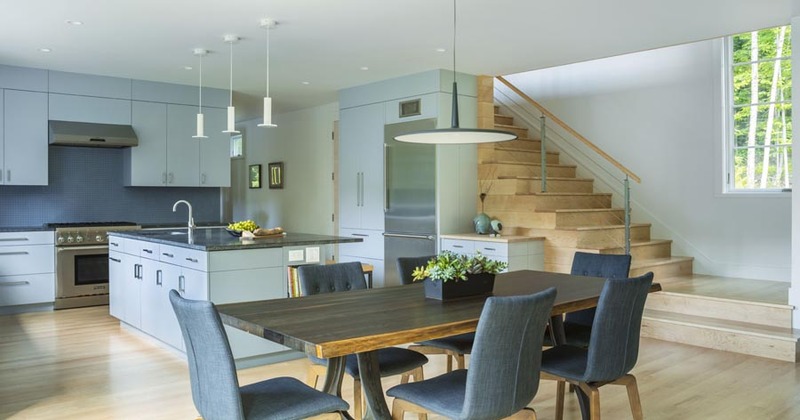 A dining room table made of reclaimed American walnut with ebony inlays, complete with old nail holes, was another Sisler Builders creation, as were a number of built-ins and custom cabinets. Steve stands in the entryway, which features a beautiful granite staircase, and points to the inviting and airy view into the living room. The plans originally called for a wall that would have blocked this view, until Steve proposed an alternative that allowed light in. It was one of many on-the-fly design changes that required close communication. For two years, Jennifer and Shawn Donovan of Waterbury Center had been scouring central Vermont for the right house to buy. After years of renting, they never thought finding an affordable house would be so difficult. Little did they know that dilapidated house renovations were in their future. On a whim, Jen called builder Steve Sisler, owner of Sisler Builders. “Do you have any spec houses, property… anything?” she begged. In fact, Steve had something, but it was, well, not for everyone. “You want to look at a derelict building and see if it might work for you?” he replied. He made sure to note that it had great views of Camel’s Hump. Unfazed by the unusual proposition, Jen agreed to stop by the next day. The two met in Waterbury Center in front of a dilapidated and forlorn looking old house with ugly green asbestos siding. 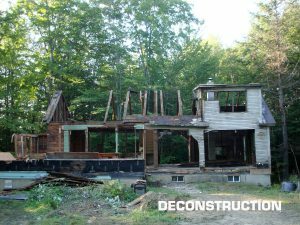 Steve explained that Sisler Builders would begin the dilapidated house renovations by tearing down the house and building on the existing foundation. He wanted to recycle as much of the building materials as possible and build a green, energy-efficient home. Jen walked around the grungy site, her shoes crunching on broken glass. She was quiet, and told Steve she’d get back to him. 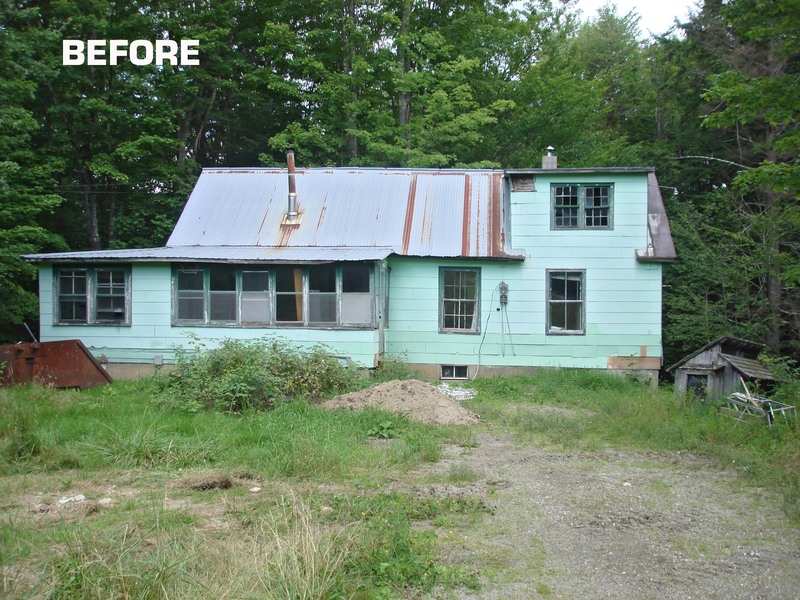 Privately, she had fallen in love with the idea of renovating an old home on that site. Jen showed Shawn the house that weekend. He was skeptical, but intrigued by the ideas that Steve had proposed, and motivated by his wife’s enthusiasm. 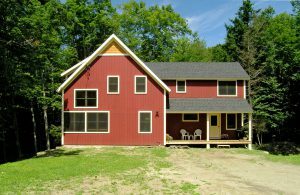 A few days later, they called Steve to say they were interested – with a catch: could he build their dream three-bedroom, two-bathroom house for $180,000? 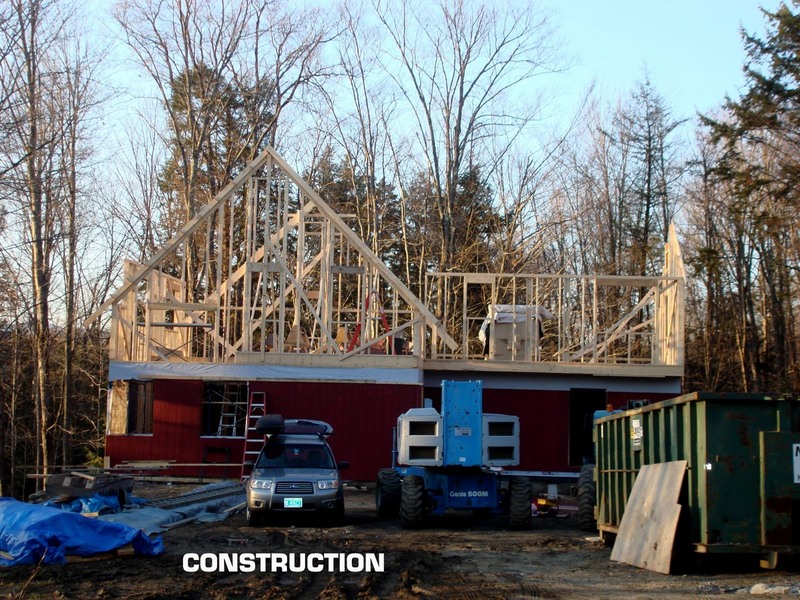 “That will be a challenge,” Steve replied, “but we’re willing to accept it.” It would be the leanest construction budget for a house of this size that Sisler Builders had done in years. 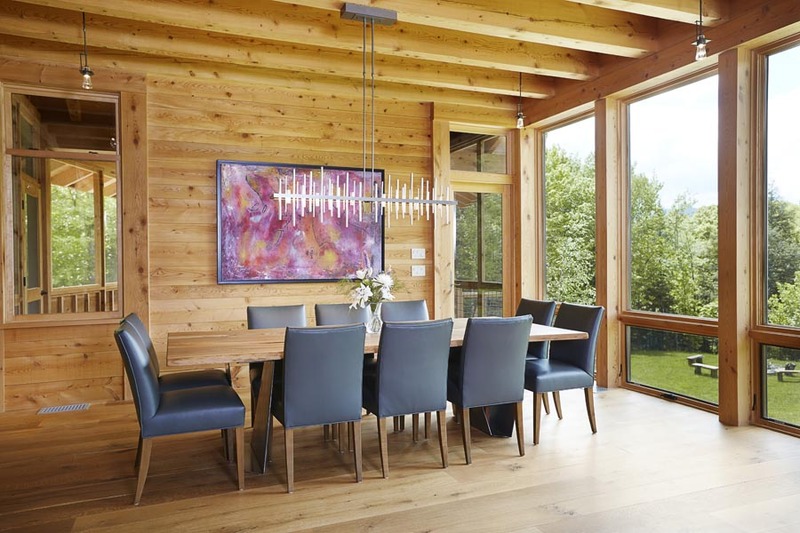 But Steve and his colleagues, led by site supervisor and carpenter Matt Rouleau, were eager to demonstrate that with creativity and experience, building state-of-the-art energy-efficient homes – their specialty – could be done on a budget and a tight time frame. 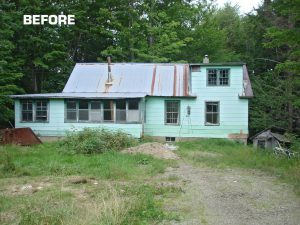 Steve, Matt, and their subcontractors came to the Donovans with numerous ideas for how to save money and energy while building something beautiful and practical from the dilapidated old house. By using the existing 20-year-old concrete foundation, deemed sound by a structural engineer, the couple could save $30,000. Steve and Matt proposed using T-111 siding instead of clapboards, for a savings of around $12,000. Plumbing subcontractor Don Clark pointed out that an acid-etched concrete floor with radiant heat had the dual bonus of being more efficient and $2,000 cheaper than a hardwood floor. Electrician Mike Cannon proposed installing the electrical service in a way that saved significant costs. 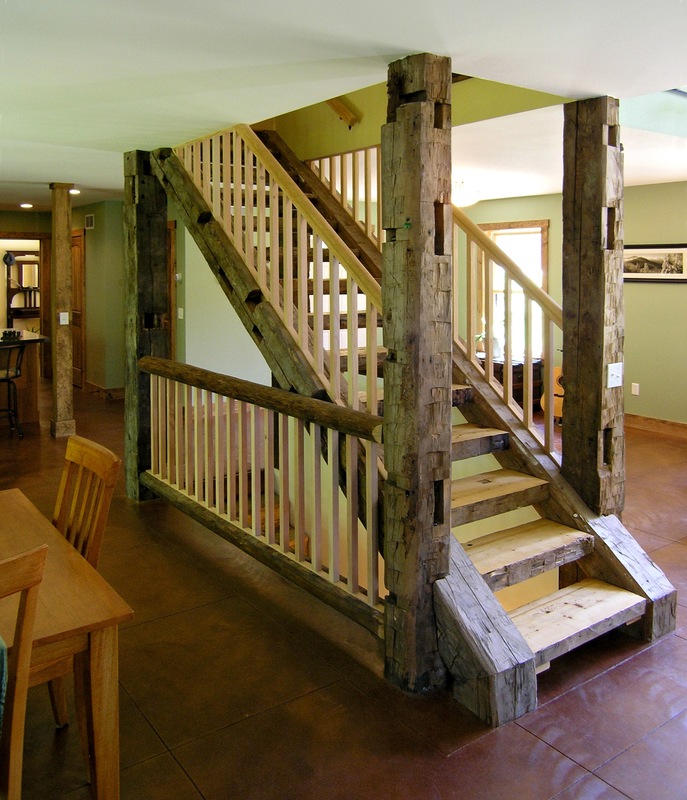 Noi Jones and Kevin Kinney got to work fabricating the central staircase using exposed old structural beams. 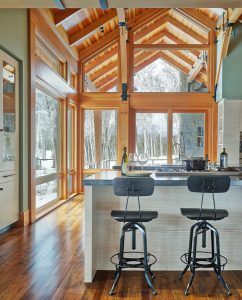 A passive solar design featuring lots of glass would bring in light and views, and keep the home warm. Steve would design and draw the house plans himself, and Jen and Shawn offered to do their own painting and buy and install all the appliances and cabinets. After making one minor change to the design, the couple “absolutely let us run with it,” recounts Steve. Five months after the dilapidated old house renovations began, Jen and Shawn Donovan moved into the beautiful new home that rose in its place. 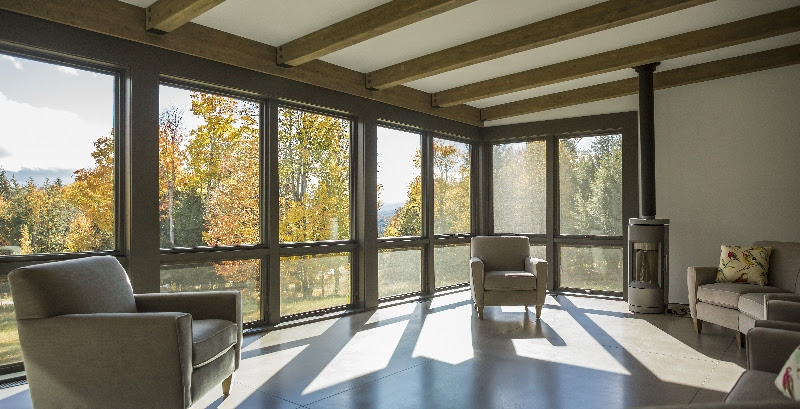 Light streams in through the numerous south-facing windows that extend from floor to ceiling. The distinctive profile of Camel’s Hump feels close enough to reach out and stroke. Warmth rises from the heated concrete floor. Weathered barn board from the old house forms an interesting corner, and a staircase in the center of the living room features hand-hewn century-old posts, railings made of peeled logs that were formerly rafters in the old schoolhouse, and stair treads cut from the original massive 8×8 beams. Old melds seamlessly with new.